Mahane Yehuda, also just called the Shuk, is an outdoor, covered market (so you can visit even on one of those cold and rainy Jerusalem winter days) that sells fruit, vegetables, grains, legumes, spices, halva, baklava, bread, pastries, chocolate, cheeses, salads, fish, meat, housewares, clothes, flowers – almost any food you could think of. When walking around Mahane Yehuda you stimulate all your senses: sight – check out the arrangements and colors of the fresh fruit and vegetables, sound – listen to the vendors hawking their wares, Middle Eastern music on CDs, davvening/prayers, smell – fresh breads and pastry, taste – free tastes of halva, often new fruit in season, you can always ask if you can have a taste and touch. The busiest times are late Thursday and on Friday when many people are buying things for Shabbat but if you don’t mind the bustle you’ll have a great experience. 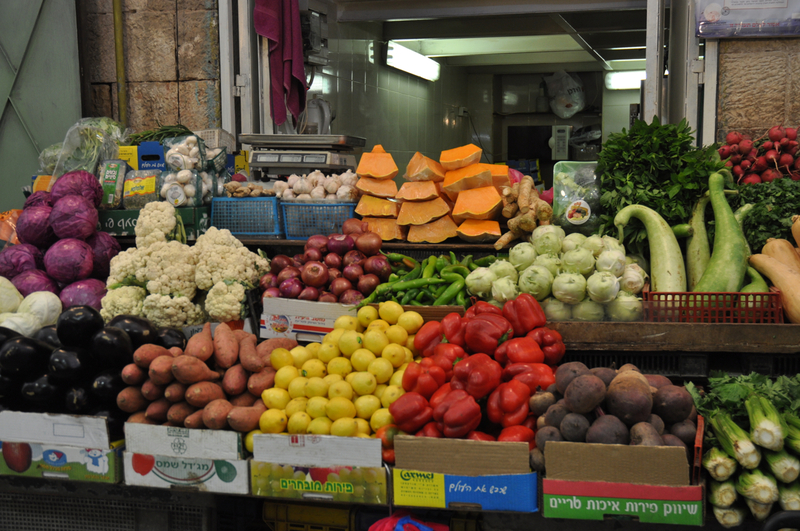 Invited to dinner, the shuk (market) is a great place to pick up something to show your appreciation to your hosts. 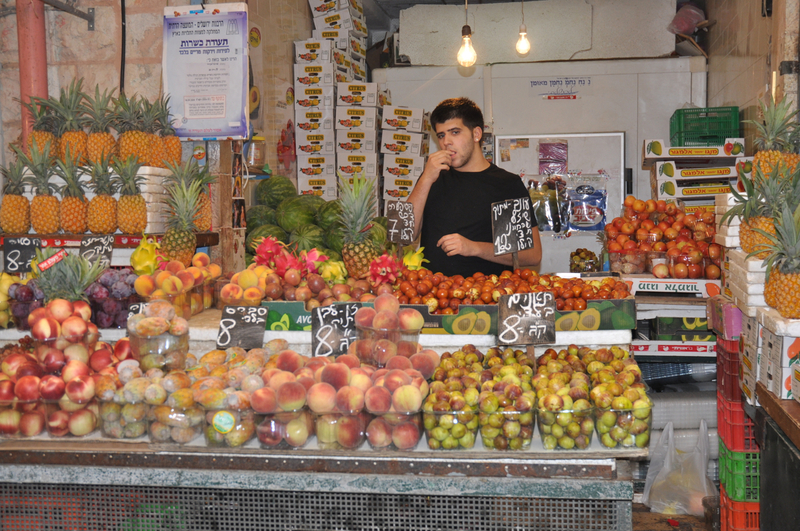 The Shuk is bounded by Jaffa Road on the north and Agrippas Street to the south; the 2 main streets of the Shuk are Mahane Yehuda Street and Etz Hayyim Street, with a number of smaller cross streets, named after fruits: Tapuah=Apple, Afarsek=Peach, Agas=Pear, Shezif=Plum, Shaked=Almond, Tut=Berry. If you agree to receive an email with my latest blog post I’m happy to email you my *FREE* map of Mahane Yehuda to help you navigate the market. If you’re interested in learning about the history of the market, discovering and experiencing its specialness rather than exploring on your own then contact me to guide you. Wine, beer and liquor, both local and imported, are available at a number of stores, the drinking age in Israel is 18 – imbibe responsibly. Israel now produces many fine wines – besides the Golan and Yarden brands, there are smaller boutique wineries all over the country (Galil, Dalton, Yatir, Etzion, Tabor to name just a few) and the prices are a fraction of what you would pay back home. Another great idea is to visit a winery while you are touring Israel and are in the area. If you’re going to pick up some Israeli wine then why not cheese and make it a party. When I lived in Cambridge MA the corner store we walked to was a Whole Foods and if you’ve ever been to one you know that their cheese department is incredible – it was one of the things that I knew I was really going to miss about living in Jerusalem. And then one day, while walking through Mahane Yehuda I discovered Basher’s, cheeses imported from all over the world (many are kosher, exercise due diligence) plus some fine Israeli cheeses; just for your information they also carry an assortment of artisan breads, fine wines and chocolates. Be careful as it’s easy to spend more money than you budgeted. If you begin to feel a little hungry, there are a lot of restaurants and cafes where you can sit down and enjoy a meal from hummus and felafel to a full, multi-course meal. Two of my favorites are Topolino, a small, family-run restaurant at 62 Agrippas that serves pasta, pizza and fish dishes (kosher) and Ichikadana, an Indian vegetarian restaurant (kosher) at 4 HaEshkol Street – the cook and owner is originally from India (in either case, please tell them that Shmuel recommended them). 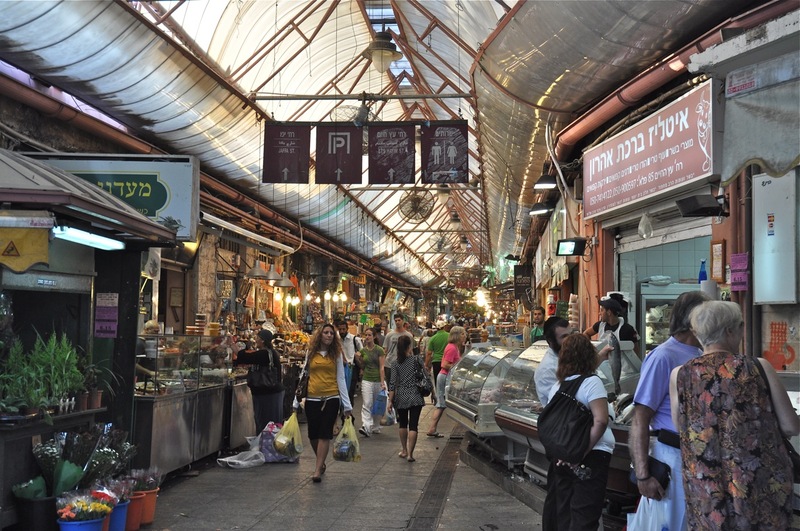 Mahane Yehuda is no longer just a fruit and vegetable market but has gentrified – today there are some fine restaurants and cafes, designer clothes, gift shops. Teller now has a stall in the shuk in addition to the bakery on Agrippas which now is also a cafe. HaEshkol Street has some unique eateries: Alfonso, a cafe with some organic items; Bistro Mimi run by a chef from France; Mousseline which may be the best ice cream in Israel and HaKhachapuriya, a cafe with Georgian specialties. Another artisan bakery at 2 HaDekel, they also have a stall in the market. Basher has opened a Wine & Cheese Bar at 21 Agrippas Street. This entry was posted in Food, Jerusalem and tagged cheese, food, gifts, market, restaurant, shopping, shuk, Wine, winery on December 2, 2008 by Shmuel Browns.